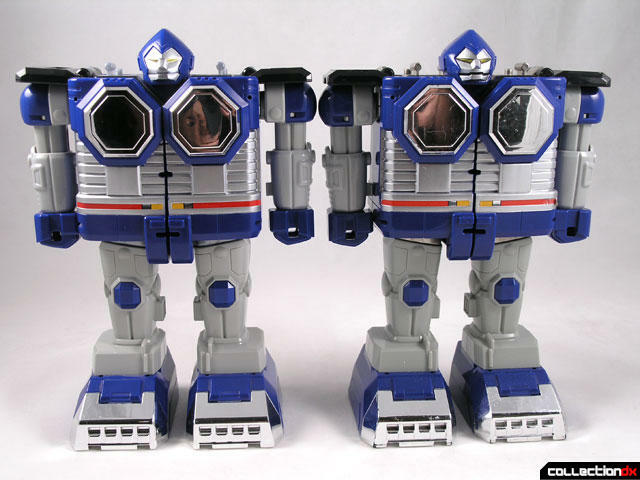 If there ever was a toy that deserved the Chogokin name, this is it. This is one heavy bot! 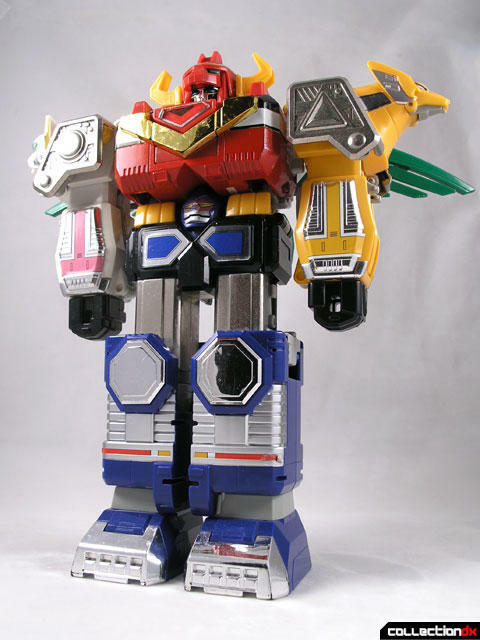 For years I only had the US version, the Deluxe Galactic Megazord. I thought it was really cool, but people would tell me “You gotta get the Japanese version! It’s all metal!”. One of my bigger regrets is missing out on this toy when it was on clearance at Mugentoys. I could have had this for a measly $20! They sold out however, and I missed my chance. This year, through a trade, I finally got him. Believe the hype – this thing is AWESOME. It has tons of metal – it’s a Chogokin brick. 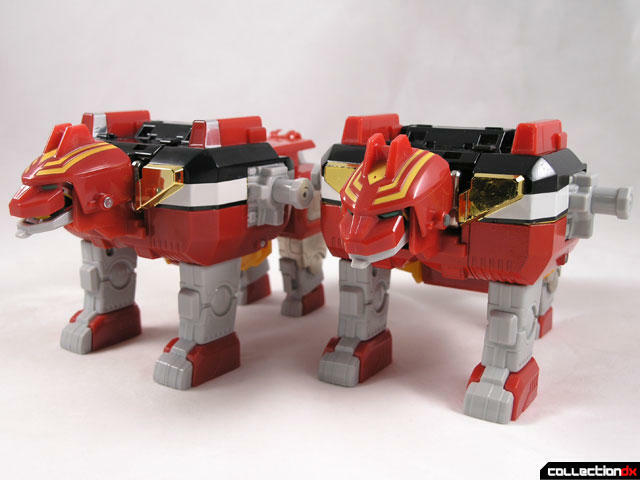 The Gingaioh DX Starbeast Combination (ＤＸ 星獣合体ギンガイオー) comes from the 1998 sentai show Seijuu Sentai Gingaman (星獣戦隊ギンガマン). It featured 5 mythical star beasts that combined to form the mighty Gingaioh! Silver Gingaleon forms the chest of Gingaioh. He’s a blocky metal lion. See the red body? It’s entirely solid diecast metal. Also metal are the legs, and the connecting bar to the head. The horns are stored under the body and are removed and attached to Gingaioh’s head. My toy is a little beat up, and missing the tail, but you get the idea. 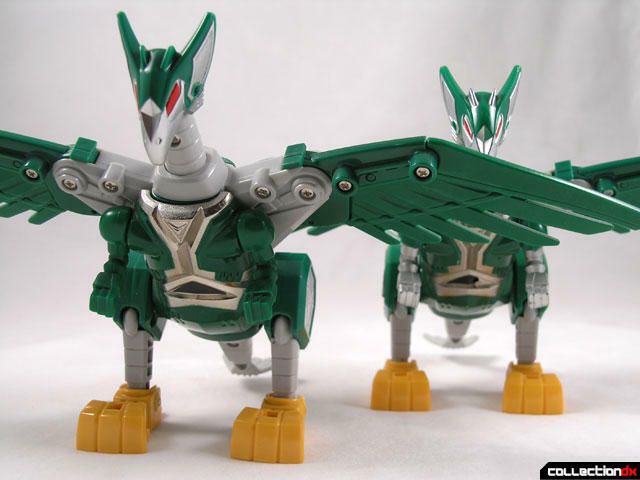 Silver Gingalcon is a Falcon like star beast that becomes the wings of Gingaioh. The front half of its body is diecast metal. Gingalcon features a cool gimmick where you push the head down and the wings move. 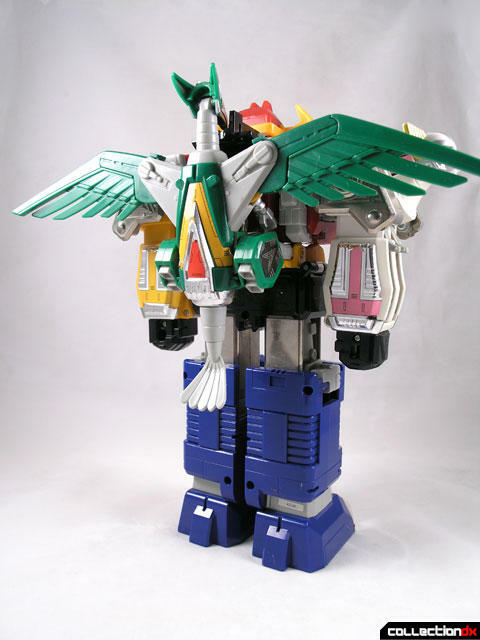 Once Gingaioh is formed, Gingalcon can separate and part of him becomes a weapon called Galcon Bowgun. Silver Gingarilla is a gorilla that forms the legs of Gingaioh. He too is loaded with metal; the entire upper legs are solid metal. The hands of Gingaioh are stored in his feet. 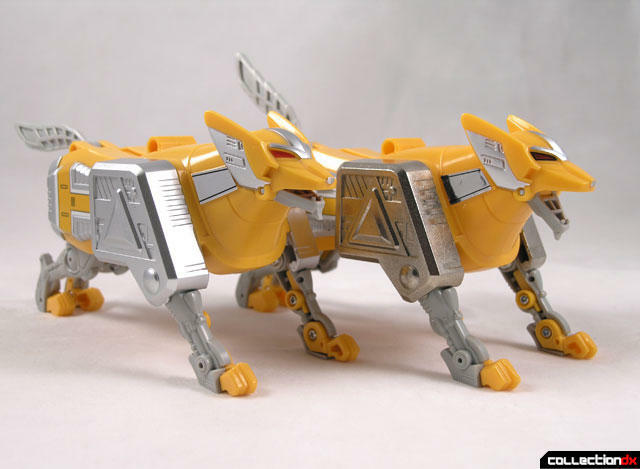 Silver Gingaverick is the Yellow Wolf that becomes the left arm of Gingaioh. Both of the large silver plates on the shoulder are metal. The mouth opens. 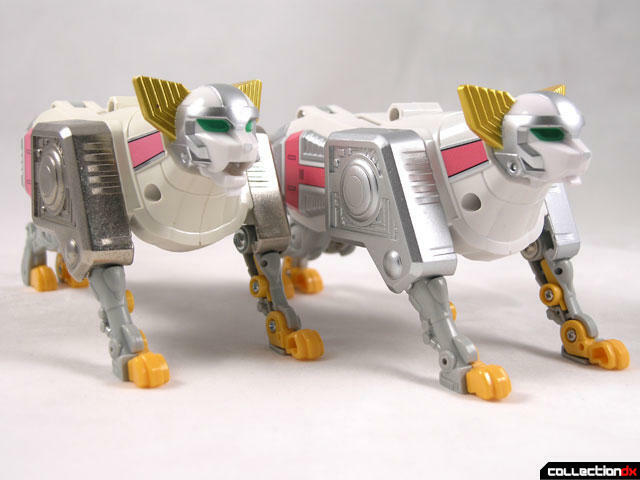 Silver Gingat is the white wildcat that becomes the right armo of Gingaioh. It too has metal shoulder plates. My Gingat is beginning to yellow a bit due to age. Gingaioh is 11" tall and tips the scale at 3.5 pounds! It’s simply massive. Gingaioh comes with a cheesy rubber-ish sword that he can hold in either hand. Bandai Also released a limited black version if the toy, the Gingaioh Starbeast Combination Chogokin DX GD-11B black version. 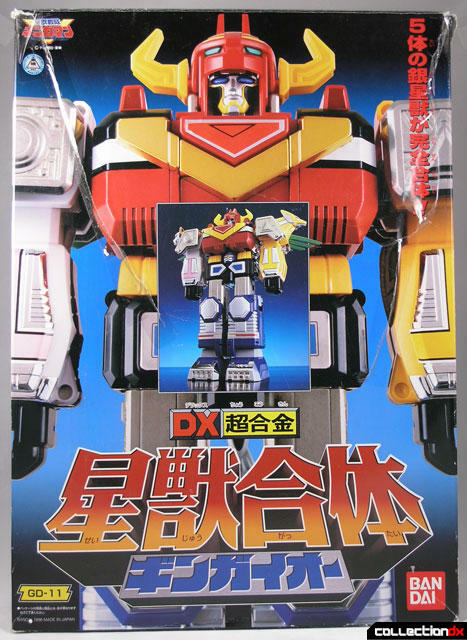 In an odd twist of events, Bandai America released a limited edition Exclusive Die-Cast DX Gingaioh in the spring of 1999. it had original Japanese packaging with a small sticker on it that said “Exclusive Diecast Zord”. 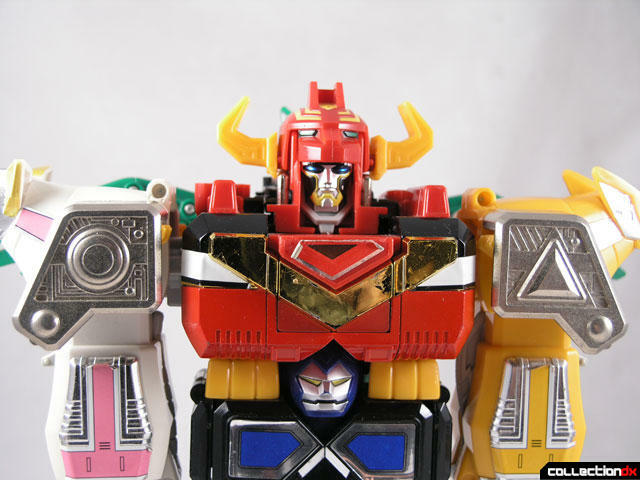 They also released a variant on the black version with the Deluxe Gold Galaxy Megazord. 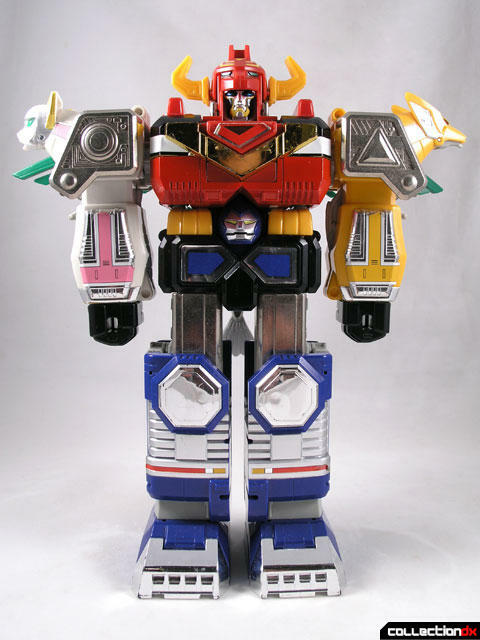 This Megazord was a FAO Schwartz exclusive version, partially plated in 14k gold. 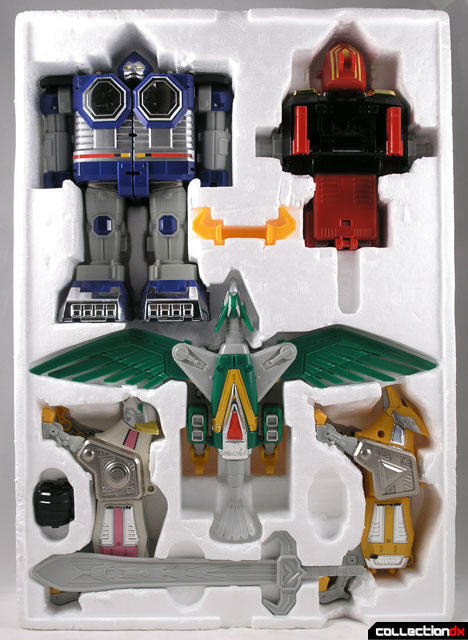 For those who want to replicate the powered up version of Gingaioh, Bandai also released a Super Armor Shine set, which included a modified chest and head piece for Gingaioh. I think this was a mail away item. 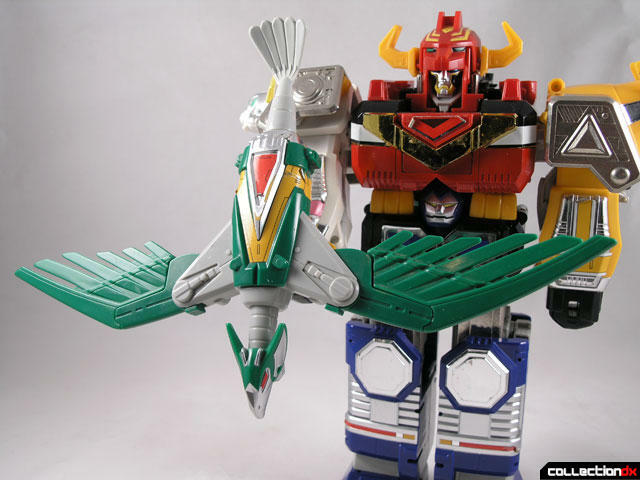 How much would the FAO Schwartz exclusive 14k Megazord fetch these days? Now that you mention it, I remember seeing one of those in a FAO when it came out, and wondering why it was in Japanese! I just got mine, a loose and used toy but still. If you want to try and kill someone, drop this from maybe just a top of the tree into someone's head.